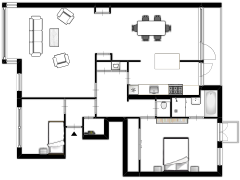 How can I get my floor dimensions from one floor to be the same dimensions on another floor? if you toggle on Dimensions (walls) in the 2D options you can see the wall sizes. Zooming in will also show the smaller wall sizes. You can toggle to feet or meters in the top bar. You will soon be able to use a background image and scale it to the right dimension, this is currently under construction for the Beta version.